Day one was a bit rough, since we hit the ground running after our overnight from Toronto to Paris, and many of didn’t get much sleep on the flight. Lori was quite a trooper (! ), visiting most of the sites on the first day with the added strain of being 7+ months pregnant with our little guy. I’m sure there has been much debate at the Juno Beach Centre (JBC) over how to structure the first day, but based on my fair bit of personal experience with jet lag, an active first day after a redeye –and a subsequent good night sleep– is the way to go when trying to get clocks re-syncronized. The day was so interesting, I almost forgot my weariness and how gross I felt without my morning shower. Old sugar factory near the start of the Canadian Corps. advance into Courcelette. This is where it becomes important to have your very own professional historian along! Mike Bechthold, a professor of military history at WLU, and co-author of multiple works on Canada’s role in WWI and WWII, provided us with great context to help us paint a mental picture of the battles, as we visited the many sites. It was over this field that Canadian Corps made their debut in the Battle of the Somme, eventually advancing two kilometres and taking their assigned objective, the town of Courcelette. This battle within a battle was called the Battle of Flers-Courcelette. This battle is often noted as the first instance of tanks being used in warfare, with two very primitive tanks helping the Canadian Corp in their march (probably more of a muddy crawl) into Courcelette. A short bus ride took us to a monument which commemorated this first tank battle, which was adorned with little model tanks. 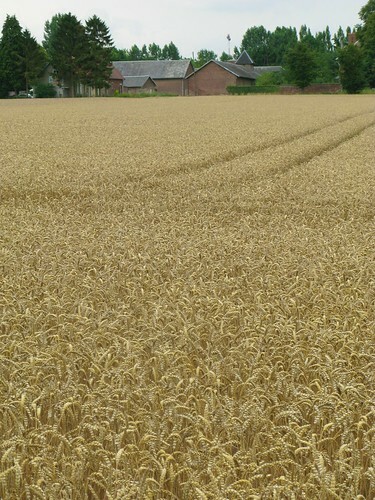 And you thought this was just a wheat field didn’t you? I would have too. I would show you the ugly memorial that Canada put up to designate this as a site of historical significance, but it is ugly so I won’t. Apparently there was only so much money to go around building memorials, and some had to be skimped on to prioritize others. Vimy was one of these places, and you will see in my next post that this was probably a good choice. Our next stop was to see the tank monument I just mentioned, and the monument commemorating the Australian involvement in The Somme at the Battle of Pozières (right next to the tank monument). There is not much left of this site, called the ‘windmill site’ because the mill, and the town that it used to be part of, got shelled into oblivion during the 1916 battle. The Australians sustained heavy losses (23K casualties with almost 7,000 dead) and were eventually relieved after their successful battle by the Canadians, who then used this as the starting point for the battle of Courcelette (I guess that is why the tank monument is here). 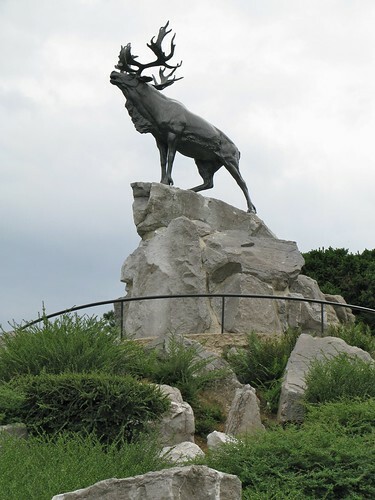 We stopped at a site familiar to any Newfoundlander, the Beaumont-Hamel Newfoundland Memorial. Unfortunately, even though our group represented a good slice of Canadiana, we had no Newfies in our group. Luckily, the excellent tour guide provided by the site (what was his name?!) was from Newfoundland, and did a great job explaining the significance of this site to Newfoundlanders. Keep in mind that during WWI (and WWII), Newfoundland was an independent dominion in the British Commonwealth; Beaumont-Hamel is to Newfoundlanders what Vimy Ridge is to the rest of Canada. Due to the high death rate (slaughter actually) of the NF core, and the small-town nature of NF, every family was touched by this battle, and some even multiple times. One thing I was excited to see (even from a distance) was something I had researched before, the Hawthorne Ridge Redoubt mine. It was a common method of warcraft in WWI to literally under-mine your opponent, fill the mine with explosives (in this case, about 18 metric tons of it) and let ‘er rip. Once the mine explodes –hopefully taking many of the enemy along with it–, the attacking force used the element of surprise to rush and take a lip of the crater as a new pre-fab defensive position. Next, and thankfully last, in our own ‘Longest Day’ was a visit to the Thiepval Memorial, dedicated to some 72,090 British and Commonwealth soldiers with no known grave. 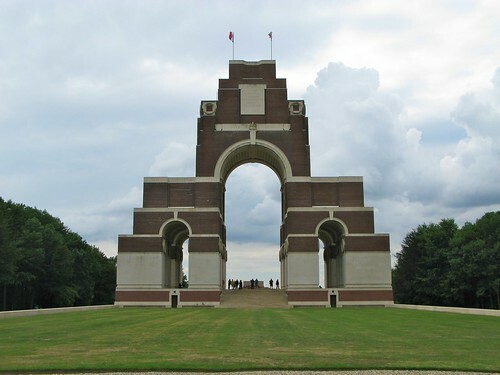 There are also many British and French marked and unmarked graves on the site, but they are far outnumbered by the names of soldiers that cover this massive monument, representing participants of the Battle of the Somme whose remains were never found. After the vivid imagery provided by the visit to Beaumont-Hamel, it becomes very easy to understand why so many soldiers were never found. If you were anywhere near the burst of a heavy artillery shell, you suddenly ceased to exist. If you fell in no-mans land, your body could get covered in tons of dirt thrown up by shelling or mines, and whatever wasn’t covered would get eaten by dog-sized rats fattened up by the bodies of the dead. Then are those that got buried under collapsed earthworks, many of whom were professional miners, not soldiers. Unless you were a rat, WWI sucked. We ended our day in Arras, where Lori and I chose sleep over being social, and grabbed a quick 4 hours before we ventured out into town to find a very strange local interpretation of a shawarma. We spent about 10 minutes trying to explain to the owner that we wanted to tip them, and in the end we just left the money and ran. It’s good to have a warm cozy sleep with a full belly in a nice hotel, in stark contrast to those that visited this area in 1916.